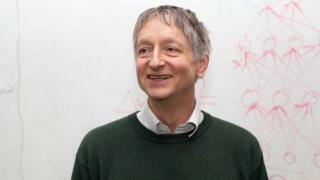 Image caption Geoffrey Hinton is known as the "godfather of deep learning"
The 2019 Turing Award recipients' various engineering breakthroughs - made independently and, in some cases, together - had turned deep learning into "a critical component of computing", according to the Association for Computing Machinery, which announced the award. "I think it's great that the computer science community has recognised that this stuff is not flaky," he said. "For many years, they thought that neural nets were not respectable. "I think we're just at the beginning of a big revolution." Yoshua Bengio, who is a professor at the University of Montreal, said on Twitter he was "extremely honoured" to be a recipient. And Yann LeCun, director of AI at Facebook, said he was "very honoured and thankful". A system such as this can learn, for example, to transcribe human speech or recognise a person's face in different photographs. Prof Hinton's great-great-grandfather was British mathematician George Boole. Boole invented Boolean logic, which later became a key concept in computer science. In 2015, Prof Hinton told BBC News he did not fear a hostile attack on humanity by AI, though he acknowledged there was still "a lot to worry about". When asked after his award win about the ethical questions around how AI could be misused, he said: "If you get something that increases productivity, it should be good, whether or not it actually is good [and] helps people in general is a question for the political system." "You have big labs like the Deep Mind lab and there was nothing like that in 1978," he said.